We didn’t want to dance at our wedding, which is funny since we met on the dance floor in the heart of DC on a hot June night. It was a full moon, and we were both full of ourselves. There was all kinds of dancing going on the night we met. But for our wedding we craved another type of intimacy. Imagine getting married in a beautiful tulip garden at its peak then getting whisked away to eat and drink amazing Italian food. All we wanted on our wedding day was great food and family surrounding us, and Cinghiale was our final choice to help us create this closeness. For us, it was perfect. Our guests still talk about the food we served; platters of charcuterie, filet mignon on a bed of risotto, tender rockfish, and unlimited drinks. The most talked about item on the menu? The pillowy soft arancini di riso passed around during cocktail hour. The little balls of fried risotto were crunchy on the outside and supremely creamy on the inside, a perfect nibble before a sit down dinner. 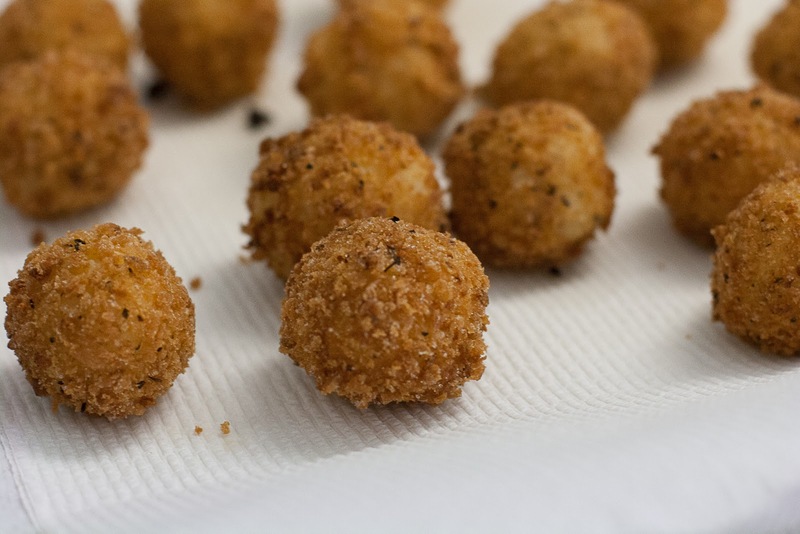 Arancini di Riso (translated as “little oranges”) are Sicily’s version of street food. After being stuffed with melting cheese (like fontina or mozeralla) and fried street side, they resemble little oranges, hence their namesake. Fillings can get very creative. Imagine these stuffed with prosciutto or bacon (of course I would think of that) or simply stuffed with a fresh pea, as I have done with this recipe. I made arancini di riso for the first time with my cousin Lauren after she mentioned how much she loved them at our wedding. She had been itching to eat arancini since then, but she couldn’t find a restaurant that made them as well as Cinghiale. The recipe we concocted completely brought us back to that day. I now make them for parties and events because they can be made a day or two in advance and frozen, and they taste just as good as when they are freshly fried. Personally, I like to make these bite sized for presentation and flavor. It takes a little more time and skill, but the smaller the arancini are the easier it is to pop an entire ball in to your mouth and get the desired gooey crunchy flavor explosion. In a large bowl, combine cold risotto with parmesan cheese, salt and pepper. Scoop a rounded tablespoons worth of the risotto in to the palm of your clean hand, flatten, and pack it with a cube of cheese and one pea. Cover the cheese and pea, and roll in to a small ball. Place on a parchment lined baking sheet. Repeat until the mixture is gone. Put the flour, egg wash, and panko mixture in 3 separate bowls creating an assembly line. Frist, dredge one ball in to the flour, then dip in the egg wash, and roll in the panko. Lay in a single layer on the baking sheet. Cover and chill thoroughly; about 1 – 2 hours (can be made one day ahead). Pour vegetable oil into a heavy large pot to a depth of about 4-5 inches. Heat the oil over medium high heat until it registers 375 degrees on a deep fry thermometer (If you don’t have a deep-fry thermometer, put the back of a wooden spoon in the oil. If it sizzles rapidly around the spoon, the oil is ready to fry). Deep fry the risotto balls in batches of 3 or 4 to ensure the pan is not over-crowded, until they are evenly browned, 3-4 minutes. Using a slotted spoon, transfer to paper towels to drain. Serving style options: Serve in simple brown paper cones topped with parmesan, or on one large platter topped with parmesan and fresh lavender. These are great dipped in fresh marinara sauce or simply on their own. To freeze: Allow the arancini to chill completely. Freeze in a single layer. Will keep for 1-2 weeks but best if reheated within a week. Reheat in a 350 degree oven for 20-30 minutes until golden and hot. 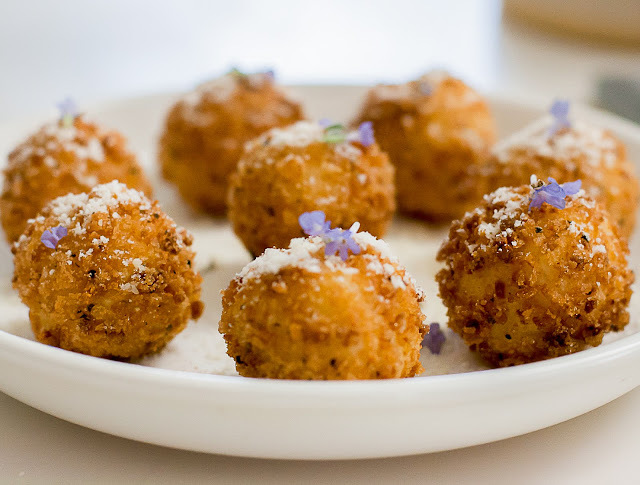 I've been having an arancini craving so your recipe comes at just the right time. Looks stunning and perfect for handing around at a party although I think I'd probably hog the plate! Hope you're having a great weekend, Kimberly. Arancini is one of my favorite treats. I say treat because good versions are hard to find in the states! There's a place here that does it with fennel and bee pollen. It's insanely good... must try my hand at making my own too! SO cute!!!! My husband and I always order Arancini, but never made it at home. I really should because it can be better at home using cleaner oil etc. Your wedding idea sounds beautiful. If you made these at my wedding, I'd stop dragging my feet and finally propose to my girlfriend. These look amazing. I had to share on my, "Whacchoo Bloggin' Bout" section.